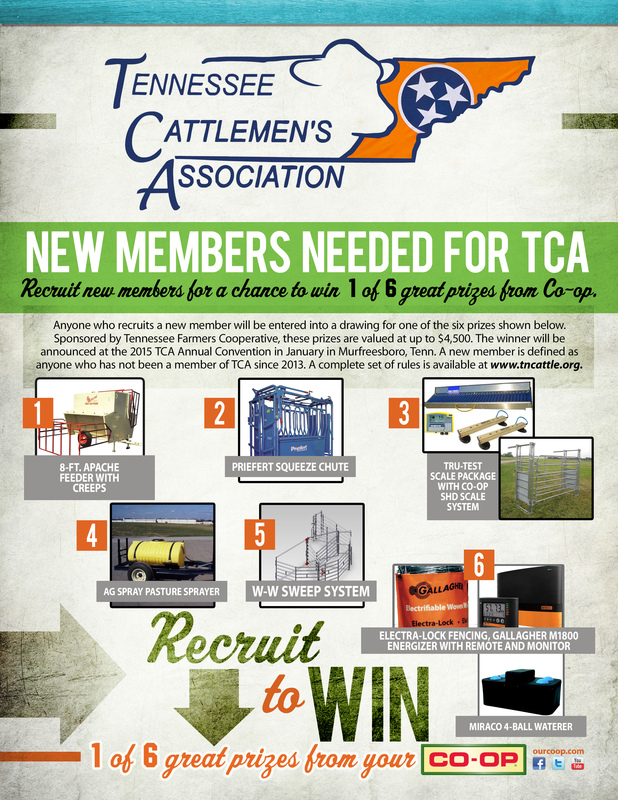 Continuing the program that was launched in 2013, Tennessee Farmers Cooperative and the Tennessee Cattlemen’s Association (TCA) will partner to offer livestock-related prizes to TCA members who recruit a new TCA member in 2015. These prizes are valued at up to $4,500. Successful TCA recruiters will be entered into a drawing for his or her choice of the following equipment: Apache Feeder w/creeps, Priefert squeeze chute, W-W sweep system, 300-gallon Ag Spray pasture sprayer, Tru-Test scale system with a Co-op alley package, or Gallagher/Miraco fence/waterer package. The winning name will be drawn from all eligible entries and announced in February at the 2016 TCA Convention Awards Luncheon at the Embassy Suites Hotel in Murfreesboro. In addition, one new member selected at random will win an expense-paid trip to the 2016 TCA convention, including a two-night stay at the Embassy Suites Hotel in Murfreesboro. Total value of the trip is up to $500. To be eligible for the drawing, the person joining TCA must be defined as a new member (not a member at any point in 2014) and must have joined the association in 2015. For recruiters, his or her name must be listed on the membership application when it is sent in to TCA with payment. Recruiters’ names will be entered as many times as they recruit a new member. Directors and employees of TFC and the Tennessee Cattlemen’s Association (the Contest Sponsors) are ineligible. Any local or other taxes or fees associated with a prize are the prize winner’s responsibility. No purchase is necessary. This Contest is open to legal residents of the United States, excluding Puerto Rico and Guam, who are 18 years of age or older. This Contest is void wherever prohibited by federal, state or local law. Subject to applicable law, the Contest Sponsor(s) reserves the right to cancel, suspend, terminate or modify the Contest Rules without prior notice and with no obligation or liability. Prizes are non-exchangeable, non-transferable, non-refundable, and have no cash surrender value, and must be accepted with no substitutions. Unless otherwise stipulated, only one winner per household is permitted. Prizes not claimed within the allotted time will be re-awarded by another drawing. All incidental costs and expenses associated with the prizes are the responsibility of the prize winner. The chances for winning will depend on the number of entrants received during the Contest Period. Prize winners may be required to execute certain documentation in order to claim their prize. All entries shall become the property of the Contest Sponsor and their advertising and promotional agencies, and entrants understand that his/her name, residence and association with the Contest may be used for publicity or promotional purposes by the Contest Sponsor. By entering this Contest, each entrant agrees that, to the fullest extent allowed by law, the Contest Sponsor(s) shall have no liability and shall be held harmless by the entrant for any damage, loss or liability to person or property, due in whole or in part, directly or indirectly, by reason of entering the Contest or the acceptance, possession, use or misuse of any prize or prize activity. All entrants agree to comply with the Contest Rules, as may be amended from time to time. To the fullest extent allowed by law, this Contest shall be governed by the laws of the State of Tennessee, without giving effect to its conflict of law principles. Senators Orrin Hatch (R-Utah) and Ron Wyden (D-Ore.) introduced Trade Promotion Authority legislation, which establishes concrete rules for international trade negotiations that will boost American exports and create new economic opportunities. National Cattlemen’s Beef Association President and Chugwater, Wyo. cattleman Philip Ellis urged Congress to act swiftly to pass this important legislation. 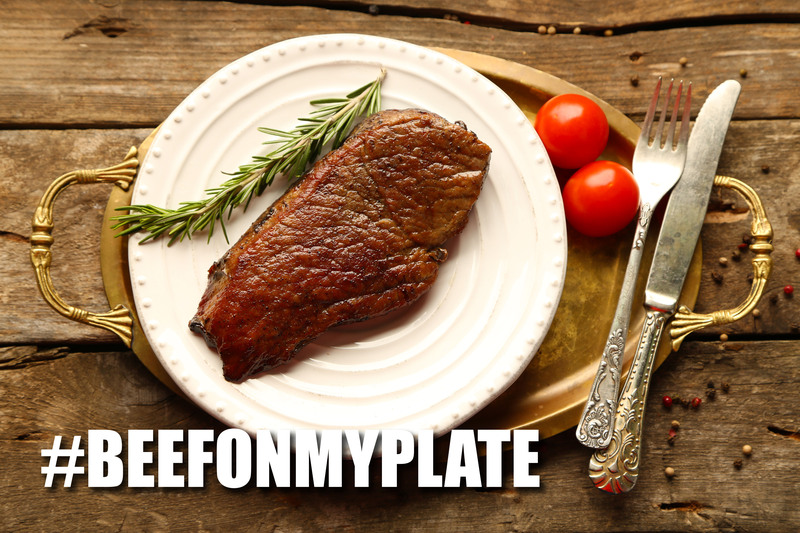 Past free trade agreements negotiated under TPA have showed tremendous success for U.S. beef exports. The Korea-U.S. FTA will eliminate a 40 percent tariff rate, Columbia-U.S. FTA will eliminate an 80 percent tariff, Panama-U.S. FTA will eliminate a 30 percent tariffs, and the Dominican Republic-Central America-U.S. FTA will eliminate a 15-40 percent tariff; all over the course of 15 years. Currently, the U.S. exports over $1 billion in beef and variety meats to these markets, with greater opportunity as those tariffs continue to drop. George and Ginger Peak of Arrowhead Ranch. Today on the TCA blog, we feature Ginger Peak of the Arrowhead Ranch. 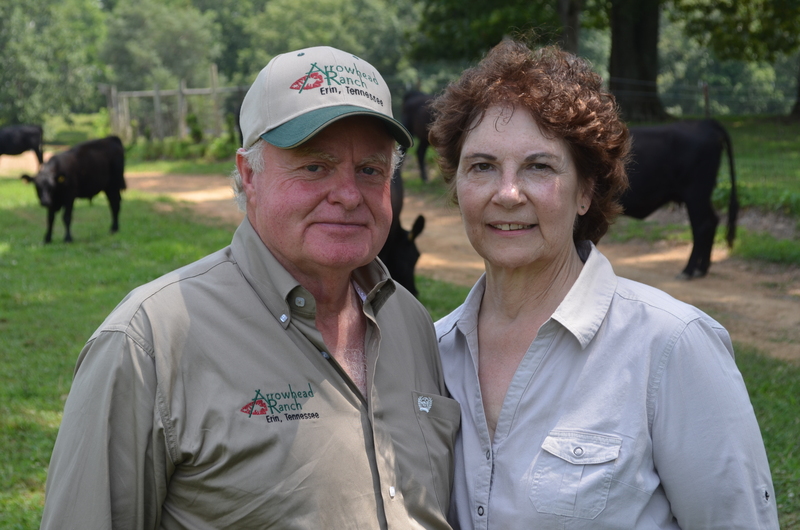 Ginger shares how she and her husband, George, got into the cattle business and how they were able to be successful along the way. 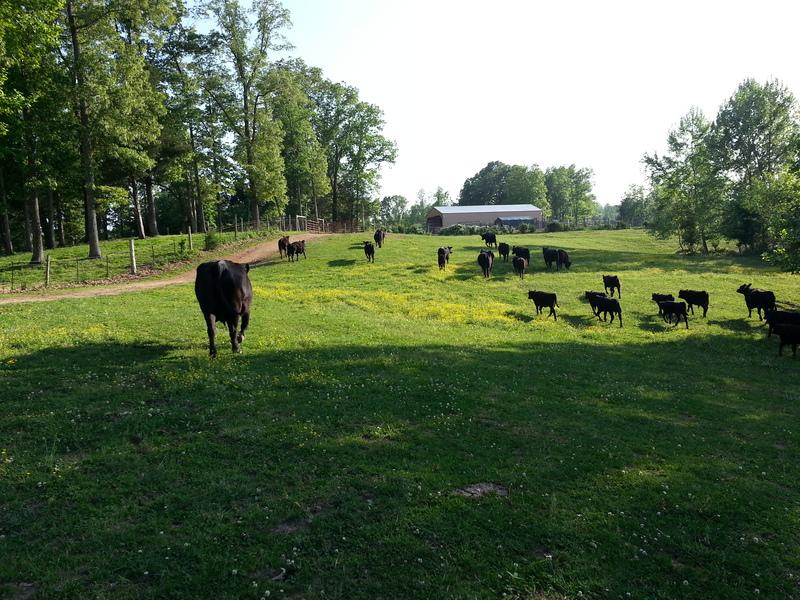 When we moved to Tennessee in 1995, we bought 154 acres in Erin, TN with the intention of raising cattle. At first, we had a commercial herd but some of our family members wanted to go into Registered Angus so we bought our first stock in 2005. As time went on, they went on to pursue other interests, leaving just the two of us to continue. By then we were very involved with the breed and all the aspects of having a registered herd. My husband (George) and I (Ginger) raise Registered Black Angus on our ranch with the part time help of one other person. We have 48 in the herd at this time but more calves are due this month. George retired last year and is now running the ranch full time. I have an off-ranch job as well so most of the work is done by him. We are most proud of the strides we have made in our genetic program. We DNA test all our cattle to determine their genetic value at birth. When you have a small herd with limited resources, it is essential to put your efforts into only those that will provide you the results you want to achieve. Both of us grew up in the Midwest but not on working farms. That has made this effort such a learning process. However, we both love to research and learn about cattle and are not hesitant to put new ideas to work. The benefit is that we don’t have “the old way of doing things” to get in the way of how we operate now. Our favorite part of having our ranch is the freedom it allows us to have our own business and we get to enjoy our cattle and the nature around us every day. It is difficult to grow a business with limited resources and only a few people to rely on. This is a full time activity with no days off. There is feeding, fencing, repairing machines, seeding fields, and much more that is involved in building and maintaining our facilities and pastures. Add to this, breeding AI, calving, finding the correct nutrition, keeping records, and marketing the cattle. All this goes on no matter what the weather. You have to love it! What is the one thing you wish more people knew about life on the farm? It is hard work and you have to be engaged 24/7. However, you are free from a human boss and get to enjoy your cattle, some beautiful days, and the satisfaction of watching a new calf get their first milk from their mom. You can watch calves running and playing together and get to know the funny things about your herd—like the calf that took the key out of your UTV and ran off with it. You meet a lot of good people willing to share their knowledge with you and to offer a hand. The grandkids love to visit the ranch. They take part in roundups and feeding the cattle. They get to go fishing and ride ATVs. We are fortunate to be able to share this with them and make memories that last forever. It is a great advantage to work together for the same goals. You get to celebrate successes and share disappointments. But when you work together for your future, it makes it all worth it. Operate your farm or ranch as a business right from the start. Document everything and keep good records. Don’t expect a quick return at the beginning; you need to be in it for the long haul. Embrace new technology and keep up with social media. Get involved with associations related to your livestock. Enjoy this way of life and do it because you love it. Be a good steward of your land. Keep up with all the advances in technology with the tons of cattle resources available. Read everything you can. Attend learning courses that are offered. Take advantage of Tennessee programs for cattle producers (like TAEP). The state of Tennessee is very favorable to agriculture. 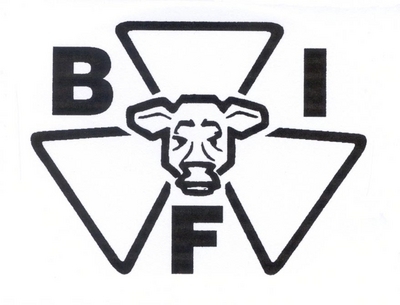 The meeting will allow the research community and industry to meet and discuss issues surrounding the genetic improvement of beef cattle and for attendees to learn about technologies and management practices that can aid in the profitability of their operations. On June 10, the meeting will start at 8 a.m. with a welcome and general session. Presentations and technical breakout sessions will follow through June 11. Attendees are invited to participate in a spouse’s tour on June 10 and a producer tour on June 12. Some of the topics to be covered include setting the stage for cowherd rebuilding, what sustainability means and why it matters, what sustainability data say about the beef industry, how current market incentives affect genetic selection, profitability: looking to an operation’s future, balancing novel and proven applications for female selection, cow lifetime productivity, and an adaptability panel discussion. A link to online registration for the conference is now available at http://beefimprovement.org/library/registration-info. Early registration is offered at a discounted rate and ends April 15. Early registration cost to attend the full conference is $250. Day-only, student and media discount rates also are available. A room block is available at the conference hotel; go online to http://beefimprovement.org/library/general-information for room block instructions. The meeting is approved for 14 CEUs for American Registry of Professional Animal Scientists (ARPAS) members in attendance. about this year’s event, contact Brandi Karisch, Assistant Extension/Research Professor with Mississippi State University at 662-325-7465 or bkarisch@ads.msstate.edu. The Tennessee Cattlemen’s Association membership is rich in cattle history. Today, we feature Diann Bussell of Carthage, TN. She writes about her family’s involvement in the cattle business and how the next generation is learning to love the livestock, as well. 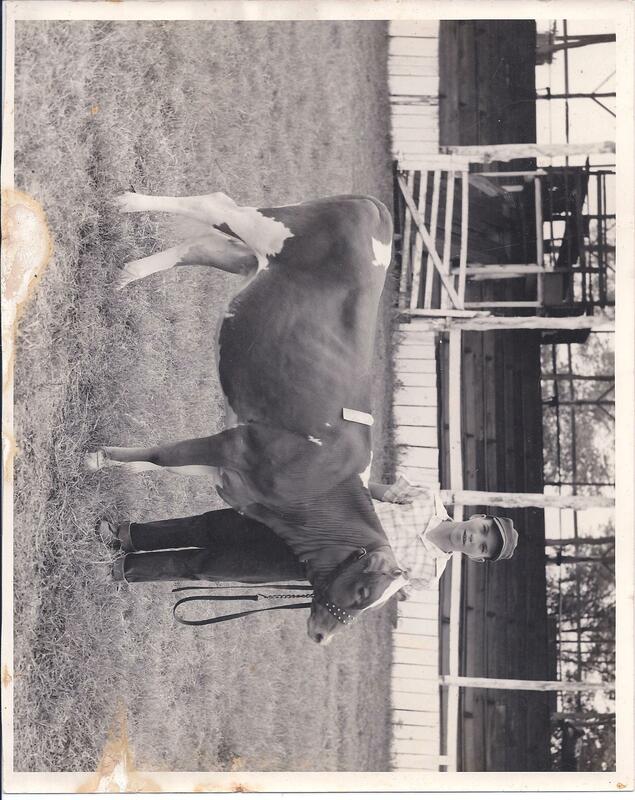 Diann’s father and his dairy cow, Sammy Bridgewater. I have been involved in raising cattle my whole life. My parents and grandparents all raised cattle. I grew up on the family farm where my father and his parents raised dairy and beef cattle. My father grew up raising and showing dairy cattle and they also had beef cattle. When I was a little girl my grandfather gave me my own dairy cow. I guess that would be the way I truly got started with cattle. 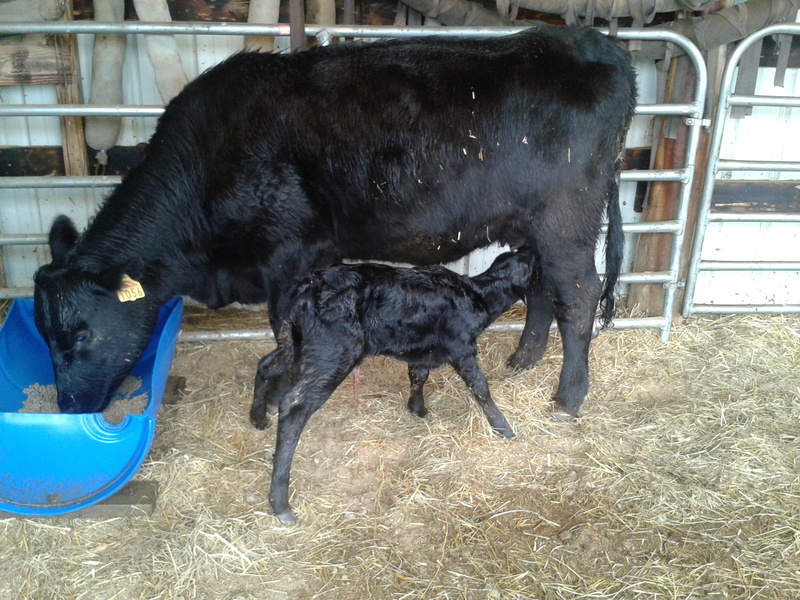 When I got older I began showing registered beef cattle, my first calf was an orphan that I bottle raised. My brother and I showed registered Polled Hereford cattle all through school. When I married in 1992 my husband had a commercial herd of beef cattle and we have continued to work on improving that herd over the years. My son began showing registered Black Angus cattle in 2005 and my daughter began as soon as she was old enough. Currently my daughter and niece and nephew are all showing Black Angus, sometimes my daughter also shows commercial heifers. My children purchased a small herd of commercial cattle and rented a farm to run their herd on. My husband and I helped to supplement their herd in the beginning by furnishing hay for the herd. So raising cattle has been a family tradition for generations. Today we have a 40 head commercial cow-calf operation and are improving the herd by breeding to a registered Black Angus bull. We retain our heifers to increase the cow calf herd and to use as replacement cows. We are currently working on implementing a rotation plan for grazing for the operation. I always loved being around the animals and working with them. One of my first memories is riding on the mules as my grandfather plowed the fields. I would also go and help my grandparents milk the cattle. Then in 4th grade I began showing cattle and that was my true joy. I loved showing and all that went with it. It took a great deal of hard work and it seemed to be a never ending cycle, but I loved it. The cattle industry has been trials that most producers must face daily. We have all had to work to overcome the rise and fall in the beef prices and the demands placed on producers. As a beef producer we have to stay current with the needs of our animals and to produce top quality animals for the market. 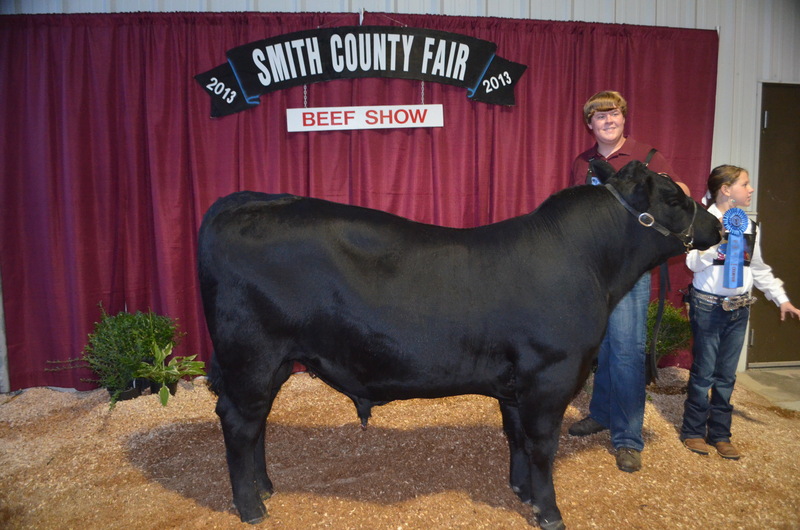 Samantha Bussell showing her cattle. Most people do not understand the dedication and hard work that is required to farm. There numerous problems that most farmers face daily. A trait that most farmers’ posses is to think outside the box and look for various solutions for the problems they are facing. Producers have to face the misconceptions that many have about how the animals are raised and treated. My family has been active in the Smith County Farm City Day for years as a way to get the information out about where your food and fiber really comes from. My husband, Ronnie, heads up the program and he and both of my children conduct different stations at the event. Ronnie does the honey bee booth, Nicholus does the Horse booth and Samantha presents the cattle booth. Most students are several generations removed from the farm and truly don’t understand that they hamburger all began on the farm. We do this as a way to educate and inform the students about the reality of farm life and where their food and fiber comes from. I would say that I am blessed to be able to work with my family on the farm. I have watched my children grow and develop skills that are way more advanced than their age. I have watched as my son has taken skills he has learned on the family farm and develop a business plan and began his own greenhouse business when he was only 15. I have watched my daughter gain leadership skills and citizenship skills through her involvement with her show cattle and her farmer’s market produce operation. It is meaningful to know that your children understand how their farm impacts their community and world. They understand that they must be good stewards of their farm, because it is relevant in the big picture of their world. One must realize that a farmer can make a difference and must hold themselves accountable for their actions. Nicholus Bussell showing his cattle. I would advise anyone starting in the cattle business to develop a good business plan and to have more than one. Currently we are seeing very good prices for beef and that would make is a very expensive investment to begin in the cattle business. If prices hold steady there is a profit to be made, but as with any farming business prices are subject to change. So you need to understand and plan for that aspect of any farming business. I would seek out advice from successful cattle farmers and truly evaluate the advice you are given. One of my favorite dishes is of course a good grilled steak and my other favorite is a slow cooked beef roast. One of my favorite quotes about farming comes from the book, “Bringing it the Table: Writings on Farming and Food” by Wendell Berry. Submit an application by June 1 to be considered for the NJAA ambassador position. The National Junior Angus Association (NJAA) is now accepting applications for the Angus Ambassador competition. An elite representative for the Angus breed, the ambassador serves a one-year term as spokesperson for the NJAA’s nearly 6,000 members. Applications must be postmarked by June 1. “The Angus Ambassador position is a unique opportunity for one of our junior members to build upon their passion for beef cattle by interacting with other Angus producers, industry influencers and others throughout a number of events during the year,” says Jaclyn Upperman, American Angus Association®’s director of events and education. 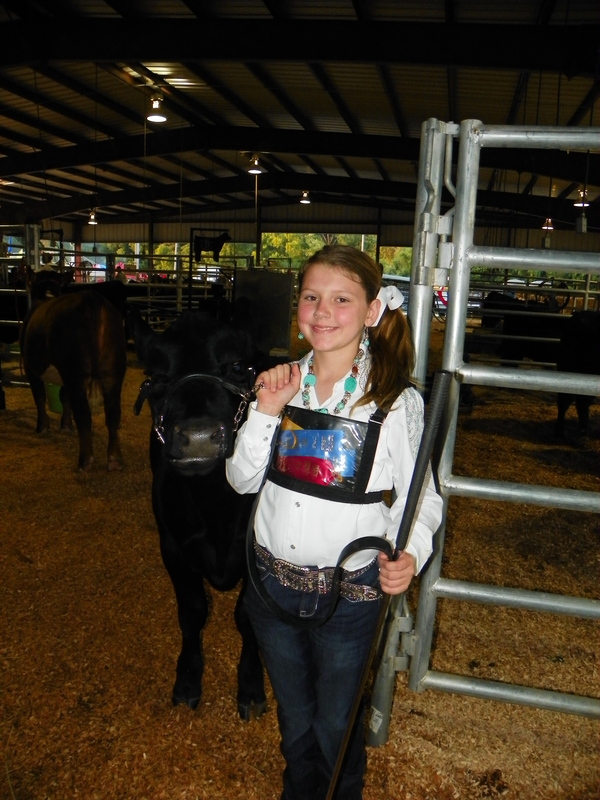 Emma Jumper, Paragould, Ark., is currently serving as the 2014-2015 Angus Ambassador. A former National Beef Ambassador, Jumper’s involvement in the beef business runs deep. She and her family operate Rock Creek Angus Ranch in northeast Arkansas, where Jumper says she experienced some of her most important life lessons. Jumper is a junior at Mississippi State University double majoring in business administration and foreign language. While serving in the position, the Ambassador will travel to the Angus Means Business National Convention & Trade Show in Overland Park, Kan.; a Certified Angus Beef® Building Blocks Seminar in Wooster, Ohio; the National Cattlemen’s Beef Association Cattle Industry Annual Convention in San Diego, Calif.; the Beef Improvement Federation Annual Research Symposium and Convention; and the Guiding Outstanding Angus Leaders Conference in Canada. Additonal travel options vary depending on the selected ambassador’s location, schedule and availability. To be eligible for the Angus Ambassador competition, applicants must be Association members of good standing, between the ages 17-20 as of Jan. 1, who own purebred cattle. They must submit a cover letter, résumé and two essay responses, which can be found online. All applications must be postmarked by June 1 and sent to the Association’s Events and Education Department, 3201 Frederick Ave., Saint Joseph, MO 64506. Once the applications are reviewed, five finalists will be invited to the Association headquarters on July 23 to participate in the final round of competition, which includes an interview and formal presentation with a panel of judges. The new Angus Ambassador will be chosen at the conclusion of the day. For more information, please visit the NJAA website.